Brady and Manning aren't on the field at the same time during a game, contrary to popular belief. Peyton Manning's team(s) and Tom Brady's team have squared off 14 times. I would say that Manning and Brady have squared off 14 times, but as they are both quarterbacks, they have never shared the field together. It's a rather strange type of narrative that exists among quarterback "rivalries." It's not like in basketball where one player can directly influence the performance of the other. This is evident when you consult the win-loss record of the respective teams. 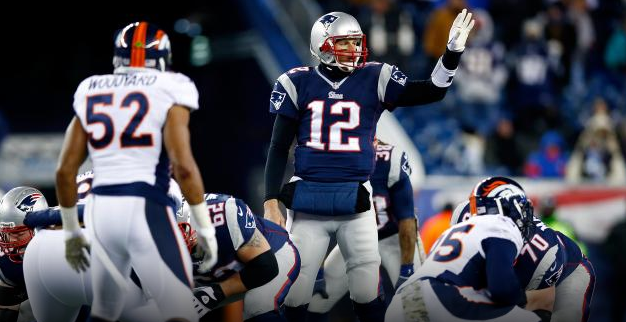 Brady's Patriots have defeated Manning's Colts or Broncos in 10 of the 14 meetings. That's a winning percentage of over 71 percent for Brady's teams, slightly less than 29 percent for Manning's. Is Brady 42 percent better at playing quarterback than Peyton Manning is? Of course not. Yet we still talk about these things as if Brady was out on defense playing middle linebacker and that's why Manning didn't play up to par. Still it is rather incredible that these two players always seem to run into each other. Of course, part of that is because of how the NFL scheduling works (division champions in the same conference always play each other the following year). But the fact that they do play each other every year is a testament to how valuable they are. They play (nearly) every year because their respective teams always win their respective divisions. And their respective teams always win their respective divisions because both of them are really [expletive deleted] good at playing quarterback. These two teams (and these two quarterbacks) met back in November, and it was one of the most bizarre games in NFL history. 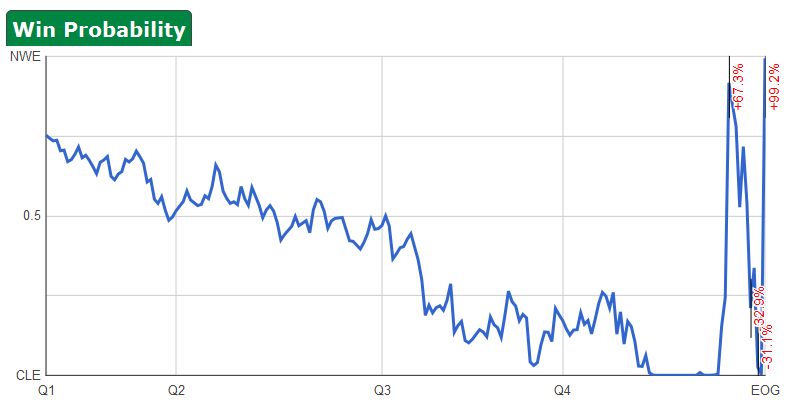 The Broncos scored 24 consecutive points in the first half, and their win probability peaked as high as 99.8 percent with 21 seconds remaining in the half (it plummeted all the way down to 99.6 percent at halftime). 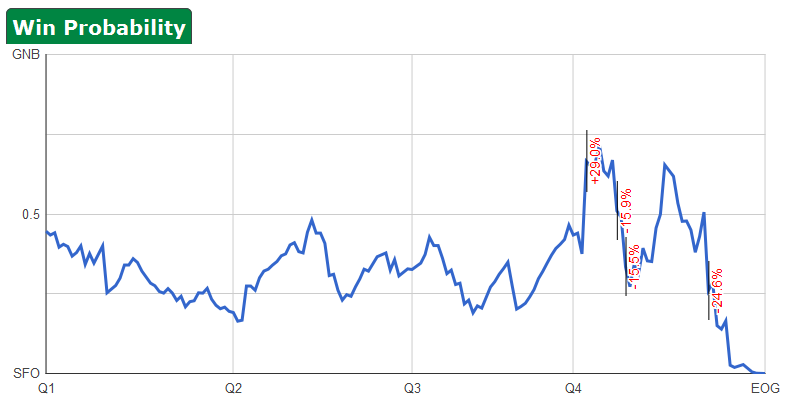 The Patriots then stormed back and scored 31 consecutive points of their own in the second half, peaking at a 94.3 percent win probability in the 4th quarter. Less than thirty minutes of football produced a swing of 194.1 percent. But the swings weren't over. The Broncos tied the game at 31 and had the ball close to midfield with 1:13 remaining, an 83.3 percent win probability. But they couldn't score and the game went to overtime. Then in overtime, the Patriots couldn't move the ball, and were forced to punt the ball back to Denver with 3:11 remaining (42.2 percent win probability). 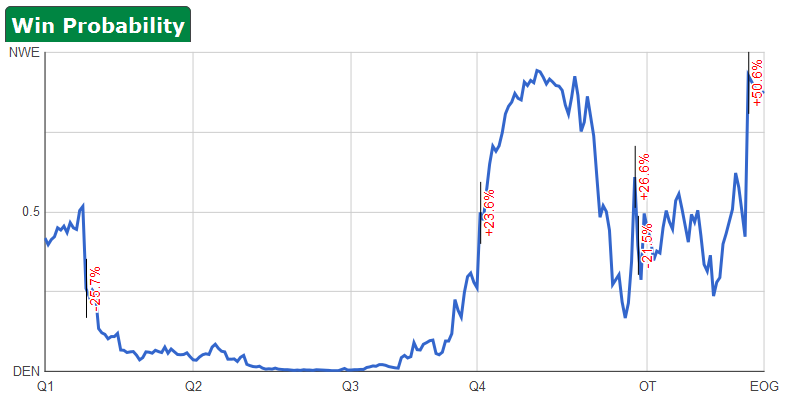 But a muffed catch saw the Patriots recover the ball at the Denver 13 yard line (92.8 percent win probability). That's not normal. The only ones that really compare this season are the Vikings-Ravens game from Week 14 that we mentioned in that week's roundup, and, coincidentally, another game from Week 14 featuring these very Patriots, when the chart looked something like this. Point being - the first game was weird. Really, really, really weird. Frankly, I'm not sure you can extrapolate much. The Broncos jumped out to an early lead because the Patriots turned the ball over three times in a span of two and half minutes (won't happen again). And the Patriots got back into the game by throwing the ball almost exclusively, because they were down by 24 (won't happen again). Furthermore, a number of players who played that day (most notably Rob Gronkowski and Von Miller) won't be suiting up Sunday. We know both of these teams struggle to stop the run, and both teams run the ball much, much better than the talking heads seem to realize (hence, all the "BRADY! MANNING!" hype), but we don't need to watch the tape from the game in Week 12 to know that. So without further ado, here's our preview for the early game on Sunday (3 p.m. - CBS). It should come to no surprise that Peyton Manning is the highest-profile player on the Denver offense. He did, after all, set NFL records for both passing yards and passing touchdowns this year. The Broncos' pass offense was ranked 1st in the league in just about every relevant metric, including Football Outsiders' DVOA, where they were 60.7 percent better than a league-average passing offense on a per-play basis. But they also had the 10th-best rushing offense in the league, and Moreno was the 6th-ranked running back, trailing only LeSean McCoy, DeMarco Murray, Jamaal Charles, Matt Forte, and Marshawn Lynch. Moreno is a huge part of the Denver offense, and he was especially so in the last meeting. Intense winds (so intense that you may recall Bill Belichick choosing the wind over possession to start overtime) left Denver's passing offense a bit lethargic, but Moreno stepped up and carried the ball 37 times for 224 yards, one of the best performances by any back in the league this year. Against a suspect New England run defense, he could play a major role. The Pro Bowl tight end (and clearly the best receiving tight end in the AFC with Gronkowski injured) did not play in the game back in November. Having Thomas in the lineup will be a major difference between that game and this one, especially on third down where he, along with Wes Welker, create enormous matchup problems in the middle of the field. If the Broncos want to have more success throwing the ball than they did last time, Thomas will need to be at his best. Attempting to slow him down will be Jamie Collins, who did play in the previous meeting, and played particularly well, with nine tackles and a key sack on Manning on a third down late in the third quarter. More than that, however, he has come on strong in recent weeks in pass coverage, particularly last week when he had one of the four interceptions of Andrew Luck (along with another sack) and generally made life difficult for Colts receivers down the seam. Collins will likely be the primary defender on Thomas (with help from safety Steve Gregory), and whether or not he can neutralize Thomas will go a long way towards deciding which team wins. With Chris Harris out, the Broncos would appear to have a huge void in their secondary. Luckily, they have one of the best corners to ever play ready to step up. Not so luckily, Champ Bailey is still nursing a foot injury and is said to be well below 100 percent. Still, he's a 12-time Pro Bowler that has played well in limited action as Denver's Nickel corner. Plus, it's really now or never for the future Hall of Famer, who has never played in a Super Bowl. The last time Bailey faced Brady in the playoffs, he picked him off as the Patriots were going in for a score, and returned it 100 yards to the Patriot one yard line, resulting in the longest non-scoring play in league history. Bailey isn't the same guy he was then, and Brady has only gotten better, but the play of both old veterans will likely have a huge bearing on the outcome of this game, for better or worse. The weather played a major factor in the first game this year - the wind was gusting upwards of 30 miles per hour and rendered the Denver passing attack mostly ineffective. It didn't stop their offense as a whole, Peyton Manning (wisely) spent most of the night checking to run plays, leading to the aforementioned big night from Moreno. Sunday's game is expected to have no such inclement weather - it's expected to be a balmy 58 degrees with no chance of rain in Denver during the afternoon, meaning Mother Nature won't be able to assist the New England defense in making Denver a one-dimensional attack, they'll have to do it all on their own. Forcing turnovers and jumping out to an early lead (like they did last week against Indianapolis, and in Week 16 against Baltimore) is one way to do it. Nobody in the league, not even the Chip Kelly Eagles, has run more offensive plays than the Broncos (1st with 72.3 per game) and Patriots (2nd with 71.1 per game). Each team has great faith in its legendary quarterback, and neither has hesitated to push the tempo with a no-huddle approach at times and, general, each offense just plays fast. Also, they're both pretty darn good, and sustained drives mean more plays. This is interesting because, at least from an outsider's perspective, it would seem these two teams will try to play at two different speeds Sunday afternoon. The Patriots debuted their ground and pound offense last week against Indianapolis, so it would seem Brady, with less weapons available to him than Manning, will want to lead long sustained drives to keep the Broncos off the field. Manning and Co, meanwhile, will want to score quickly and in bunches to test the Gronk-less Patriots offense on its ability to win a shoot out. If Denver scored two quick ones out of the gate, does New England abandon it's ground game? Conversely, if New England leads a long, 11-play, 80 yard, 7-minute touchdown drive to open the game, followed by a 20 second three-and-out from the Bronco offense, do Peyton and the boys panic? Both will be interesting to see, but it seems pretty clear that whichever team can set the tempo this game is played at will be in control. Reductively speaking, here are five aspects of football. Rushing offense, rushing defense, passing offense, passing defense, and special teams. These two teams, more or less, are even in three of those areas - rushing offense, rushing defense, and passing defense. Denver clearly has the advantage in passing offense - they had a historically good aerial attack, while the Patriots were just a moderately positive offense through the air, and that included the half-season that Rob Gronkowski played. Without him, they're appreciably worse. The Patriots, on paper, do have a substantial advantage in special teams, mostly due to their excellent kickoff coverage compared to Denver's woeful kickoff coverage. But playing in the thin air of Denver means that what may be potentially long kickoff returns in Foxborough turn into touchbacks in the Mile High City. With that advantage neutralized, where exactly do the Patriots have the upper hand? You could certainly make the case that the Patriots are better coached. In fact, you'd be hard-pressed to find anyone who believes the Broncos have the superior coaching staff. But superior coaching, a lot of times, is dependent on having requisite talent to implement the scheme of choice. The Patriots have talent, but they're so incredibly thin (and, outside of Brady and the offensive line, inexperienced) on both sides of the ball, that they're handcuffed in terms of the complexities of what they can do. This is not the deep, veteran-laded Patriots defense of yesteryear, who could beat up Manning's receivers at the line of scrimmage and disguise coverages behind them to hopelessly confuse him. 1. Aqib Talib shuts down Demaryius Thomas in 0-coverage and they're able to shade help everywhere else. 2. Chandler Jones dominates suspect Denver offensive tackles. 3. They luck into multiple turnovers at opportune moments. The first two seem unlikely, the third seems too random to be confident in either way. I'm not ruling out a Patriots win, and will certainly be rooting for one, but the matchups point to Denver having the upper hand. Bob is again going with Brady and Belichick this week, picking the Patriots to defeat Peyton Manning and return to the Super Bowl. You can get his full thoughts on the game from his Tuesday blog. I know that Denver's a decent sized favorite at home, but I love the balance New England found last week on both sides of the ball. The Patriot secondary is playing borderline outstanding football right now, and the beaten up front seven has far exceeded expectations. I'm not saying they'll stop Peyton and the Denver offense, but I think they'll at least be able to slow him down the way San Diego did a week ago. On the other side of the ball, I just don't see how the Broncos stop New England's running game. Blount was a beast last week, and the offensive line is playing way above its head right now, particularly on the injury-ravaged right side. So, I believe this comes down to the Patriots playing well enough to keep up with Manning, then I think we all know what comes next. Brady leads a last-minute field goal drive to give New England the win and another trip to the Super Bowl.